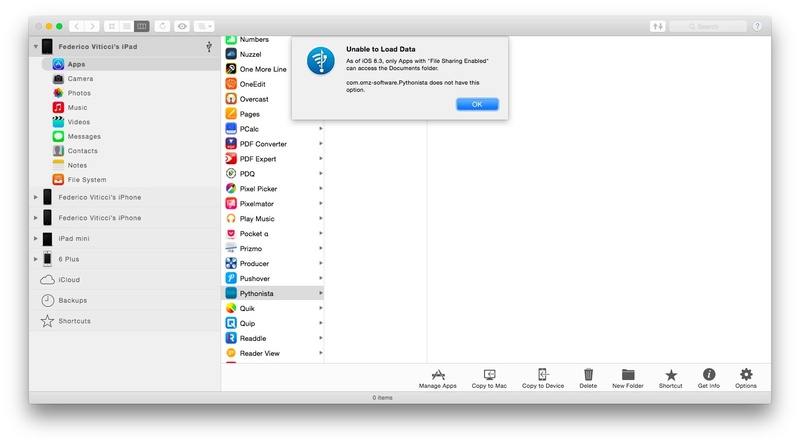 I missed this when reports first came out last week: with iOS 8.3, file managers such as iMazing and iExplorer can no longer access the document libraries of iOS apps over a USB connection. If Apple's argument is that the ability to access app files has been disabled for security concerns, I may understand that position. But that doesn't change the fact that, while some apps can still pass along files over USB to the aforementioned file managers if they support iTunes File Sharing, other apps are now cut off from USB file transfers if they don't support iTunes. Or, if they can't support iTunes File Sharing. Case in point: Pythonista. Due to rules that prevent Python scripts from being manually copied with iTunes File Sharing from a computer to Pythonista (that's a whole other topic worth arguing), Ole Zorn's app doesn't show up in iTunes. And because of other Apple rules (App Store Review Guidelines, 2.8), Pythonista can't sync scripts with iCloud or other services across devices either. I wanted to save a backup of scripts I created on my iPad over the weekend (as I always do), but I couldn't access them over USB anymore due to iOS 8.3. Instead, I ended up having to copy and paste code as plain text, create text files in Dropbox, and sync everything back to my Mac. I don't know what would be better for Apple's users – whether it'd be preferable to reinstate USB access to all app directories through third-party file managers, let users decide which kind of files they want to sync between devices, or open up iTunes File Sharing (even if Apple doesn't recommend it anymore) to more file formats. A basic question remains: if I program on an iPad and I want to access my script files within reasonable security measures, why shouldn't I be able to?